I’ll admit it, I’m a chocoholic. It’s delicious, comforting, and let’s admit it, chocolate is appropriate any time of day. When I became gluten free and reduced my sugar intake, I wasn’t sure I’d find a good chocolate chip cookie recipe out there that I’d love. I have discovered it! 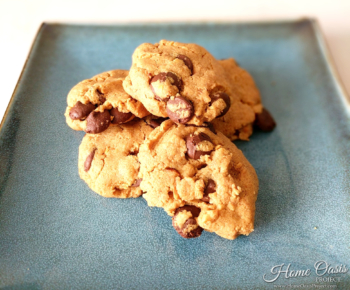 My Grain Free Chocolate Chip Cookies recipe is AIP and Paleo compliant. It’s grain free, egg free, nut free, gluten free, dairy free, AND it’s full of yummy flavor! If bet your friends and family won’t know how healthy and allergy friend it is. They’re that delicious! 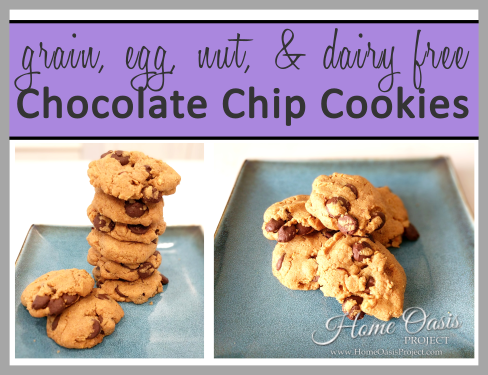 These delicious Grain Free Chocolate Chip Cookies are soft on the inside and crisp on the outside. They don’t crisp up on the bottom quite like regular gluten cookies, but they do firm up and have a great texture. Many chocolate chip recipes out there are not very nutritious. 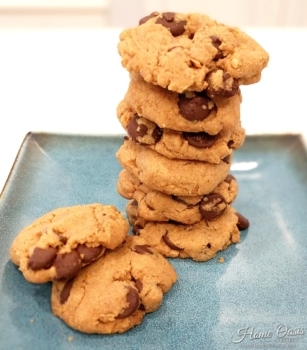 Our grain free chocolate chip cookies actually are. A large part of that is because of the grass fed gelatin. In a medium bowl, add the coconut oil and sprinkle the gelatin over it. Stir well. Stir in the maple syrup. Then add the coconut flour, vanilla, baking soda, sea salt, lemon zest, and chocolate chips. Divide the batter into 8 balls and place on a silicon baking mat or a greased cookie sheet. Gently smoosh the balls down with the palm of your hand.